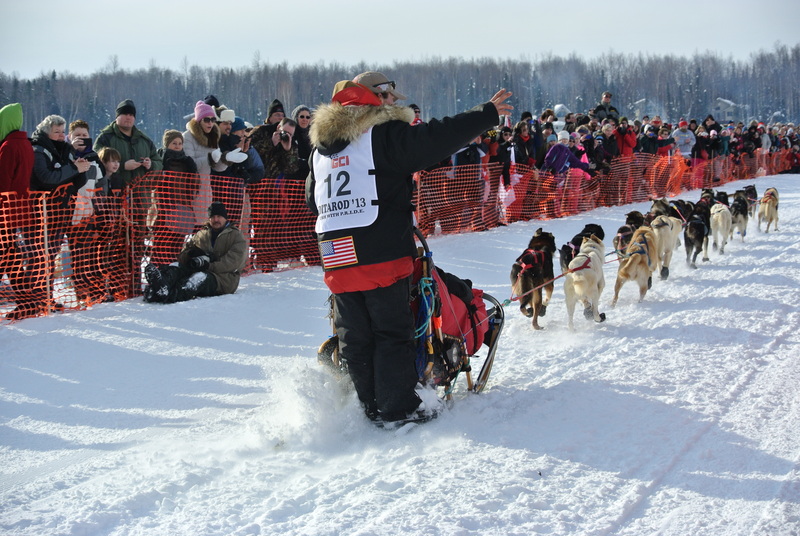 March 3, 2013 – THE DAY – The official start of the 2013 Iditarod. It was a beautiful day with Denali clearly visible in the distance. Dog teams and mushers arrived at Willow in small trucks with or without trailers or large trucks with huge trailers. Men, women, rookies and 30 year veterans have been preparing all year for this day. That’s what I love about this race – once the teams leave the starting chute, they are on an even playing field. As I walked around the dog team staging area, I marveled at the thought that 66 mushers and 1,040 dogs were about to embark on a 1,049 mile race through the Alaska wilderness in the winter. How do they do it? Why do they do it? They all have their own reasons, but the overall theme is the chance to work with an amazing group of animals. Sled dogs. The mushers were cordial with the well wishers, but they were also focused on the task ahead. They have to have all their gear and mandatory items in the sled bag, the gangline gets laid out, dogs need to be fed, harnessed, and bootied; there is a lot to do and a lot to think about. Teams left the chute beginning at 2:00, leaving at 2 minute increments. Martin Buser was the first one out and Sonny Lindner left last. The differential of the leave times will be tacked on to their 24 hour mandatory layover. Volunteers and vets are ready at the early checkpoints waiting for teams to arrive. As soon as Sonny left the chute, I was flown to Skwentna. The famous Skwentna Sweeties had a delicious meal waiting for everyone. There are smiles and hugs as old friends meet once again. This is a busy checkpoint due to the fact that racers will arrive here during the night and they are still running fairly close together. Everyone here has made me feel so welcome. Vets are having conversations – communication people are making sure their internet works correctly – there is a meeting in the side room planning for the arrival of the dog teams. Today is the start of the race for the dogs and mushers. It is also the start of my adventure as Teacher on the Trail experiencing this race first hand. It’s THE day I’ve been waiting for. Here we go! ← Ride Of My Life!